Ullanbaatar, September 11: With an aim to improve their tactical and technical skills in joint counter-insurgency and counter-terrorist operations in the rural and urban scenario under United Nations mandate, the joint exercise Nomadic Elephant-2018 between the armed forces of India and Mongolia commenced on Monday at Five Hills Training Area, Ullanbaatar, Mongolia. The 12 days long joint exercise will be concluded on 21 September. The Indian contingent is represented by a contingent of 17 PUNJAB Regiment while the Mongolian contingent is represented by Unit 084 of the Mongolian Armed Forces. 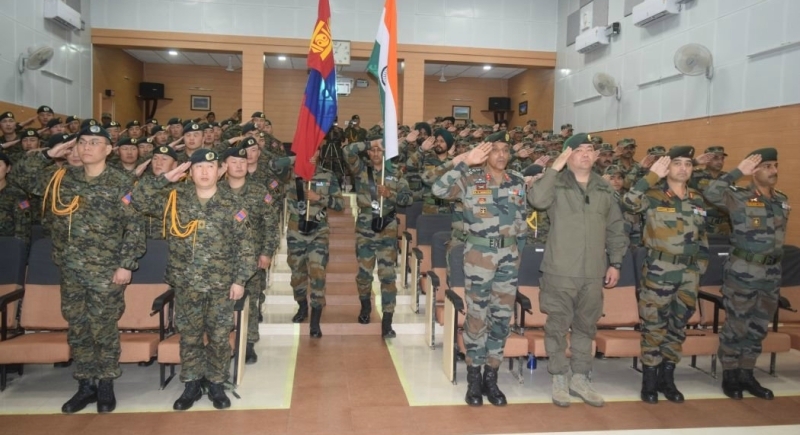 Major General J.Badambazar, Mongolian Army welcomed the Indian soldiers and in his inaugural remarks highlighted the common shared beliefs of freedom, equality and justice that are precious to both nations. The opening ceremony started with a briefing on Army organization and country presentation including display of weapons and equipment at sub-unit level. During the exercise, both sides will jointly train, plan and execute a series of well developed tactical drills for neutralization of likely threats that may be encountered in urban warfare scenario. Experts from both sides will also hold detailed discussions to share their experience on varied topics for mutual benefits. Exercise Nomadic Elephant-2018 will contribute immensely in developing mutual understanding and respect for each others military and also facilitate in tackling the worldwide phenomenon of terrorism. Exercise Nomadic Elephant is an annual, bilateral exercise since 2006 which is designed to strengthen the partnership between Indian Army and Mongolian Armed Forces.